Picking the right hosting solution is one of the first (and most important!) decisions you’ll make for your website. While there are plenty of available options, none can match the versatility and level of control you’ll get with a dedicated server. When you use a dedicated hosting service, you’ll be given a server that’s exclusive to you. This ensures that no other user will share the same resources or have access to your data. You also get full control over the server, so you can ensure your site is more secure and performs as well as possible. 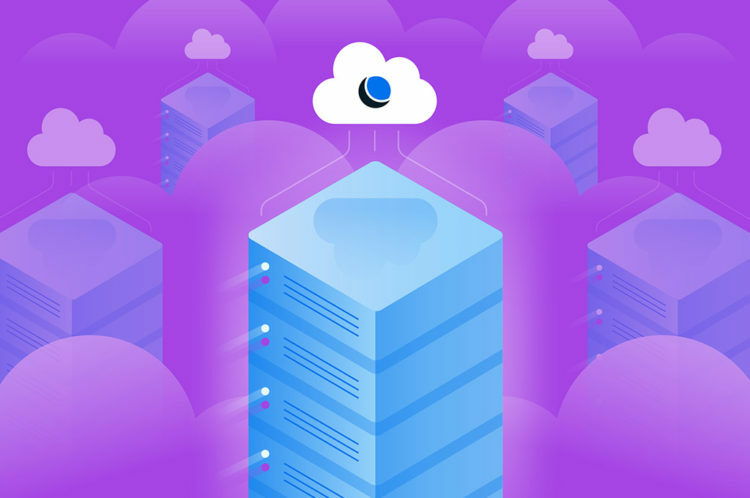 In this article, we’ll discuss the ins and outs of dedicated hosting and look at the different types of dedicated servers. Then we’ll talk about why you might want to consider dedicated hosting and explain how to pick the option that best suits you. Let’s get started! In the simplest terms, dedicated hosting provides exclusive access to a physical server. That server is only available to you and your website. This is in contrast to VPS hosting and shared hosting, where your site occupies the same server as many other users. You can think of this as the difference between renting an apartment and owning a house. With your own dedicated server, you have more freedom to configure it however you want, and you don’t have to share its resources with other sites. Improved speed and performance. Since your site doesn’t share server resources with anyone else, your site will often be significantly faster. Complete freedom and control. You can configure your server to match your specific requirements and get full access to every aspect of your site. Increased security. Since only you have access to your server, it won’t be vulnerable if another site gets attacked. 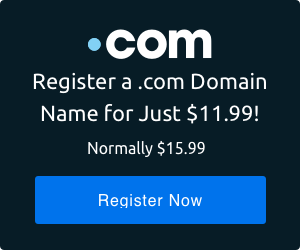 You’ll also have a unique IP, which makes it much less likely that your site will be blacklisted. More storage space. Most dedicated hosting plans include a lot more storage space for your site’s files (with up to 2TB of disk space). Of course, all types of hosting have their pros and cons. Which one you should pick depends entirely on your site’s requirements and the level of control you desire. Let’s talk about whether dedicated hosting is the right choice for you. The first factor to think about when considering a dedicated hosting plan is your site’s size. This option is primarily beneficial for larger websites, such as e-commerce businesses and high-traffic sites. That’s because these sites need to be consistently fast with a minimal amount of downtime. For a business site or online store, performance and reliability are extremely important. The fact that nobody else can access your server also ensures that your site is secure. Nobody will be able to access your stored data, and you’ll be better prepared to deal with threats and attacks. You’ll also benefit from the additional storage space. With DreamHost’s SSD hard drives, for example, you don’t ever have to worry about running out of room. Naturally, all of this comes at a price. Dedicated hosting is almost always more expensive than VPS or shared options. Whether or not that additional cost is worth it depends on your budget and needs. However, the increased performance, control, and versatility will be worth it for larger sites that can’t afford to compromise. We’ve talked a lot about freedom and control in this article. That’s because these are key factors when it comes to dedicated hosting. When you purchase dedicated hosting, you get to customize the server you’ll be using. This gives you to the opportunity to make sure your server exactly matches your requirements. Of course, every web host will offer different options. This includes the type of server, what storage solutions you get access to, the number of cores included, and how much RAM will be provided. We’ll discuss these factors in more detail later on when we talk about how to configure a dedicated server. However, there is another consideration you’ll need to think about when choosing dedicated hosting: whether you want your server to be managed or unmanaged. With a managed server, the hosting provider takes care of all the technical tasks for you. It will ensure that your site and server are maintained and running well at all times. Plus, your web host will typically take additional tasks off your hands, such as creating backups and monitoring for security risks. In contrast, when using an unmanaged server, you will need to manage all these tasks yourself — including administrative work, creating backups, monitoring your data, and so forth. Consider this option only if you have the technical know-how and ability to manage your own server. Which type of plan you want depends on your experience. If you want to take full responsibility for your server settings (or like the idea of having total control), you might wish to choose an unmanaged option. However, the majority of users will do best with a managed server, as this gives you time to focus on other aspects of your site and business. You can rest assured your site is taken care of by your hosting provider, and you won’t need any special technical expertise. If you think dedicated hosting may be what you need, you still need to find the right plan. Fortunately, DreamHost offers a fully-managed dedicated hosting solution that is both powerful and reliable. DreamHost’s dedicated hosting is perfect for any high-traffic site that requires guaranteed fast speeds and consistent uptime, such as e-commerce businesses, agencies with high-profile clients, and even hosting resellers. Since this hosting plan is managed, you’ll never have to worry about your site’s performance or security. We’ll protect your site against attacks, monitor its activity, and offer support around the clock. You’ll also have unlimited bandwidth and databases to play around with. This is in addition to full Shell Access (SSH) and support for PHP, Perl, Python, and Ruby. Our dedicated hosting is the most powerful and comprehensive option we offer. The pricing starts at $169 per month, with rates that vary depending on your unique configuration. Speaking of which, let’s take a look at how you’d go about configuring your own dedicated server. Our dedicated hosting plans are the ideal solution for high-traffic sites that require fast speeds and consistent uptime. If you’re reading this, we assume you’ve decided that a dedicated server is indeed what you and your site needs. The good news is that the process of configuring your new server is a lot quicker than you might have anticipated. We’ll walk you through how it works step by step, using our own dedicated hosting service as an example. If you already have a DreamHost account, you can start the configuration process by logging in and accessing your dashboard. Here, you’ll see the Add a Dedicated Server button, which you’ll want to select. If you don’t have an account, you can sign up for one and then get started. The process will be nearly identical for both approaches, with the exception of some additional options if you are using an existing account. 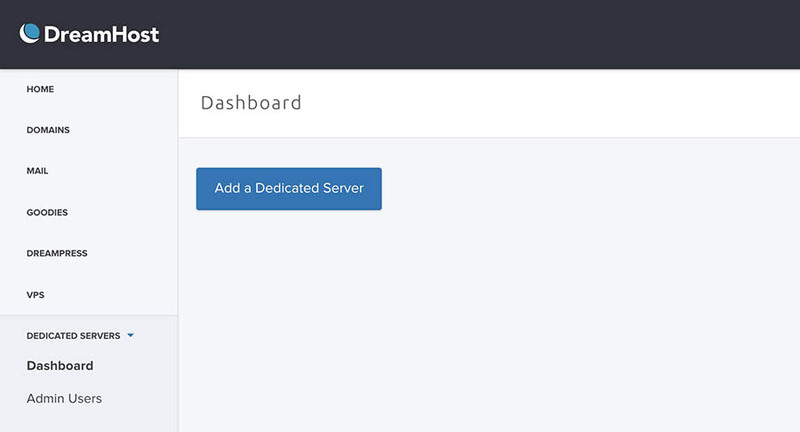 Regardless of your chosen method, you’ll now be shown a form where you can start configuring your server. If this looks less complex than you expected, we’re not surprised. 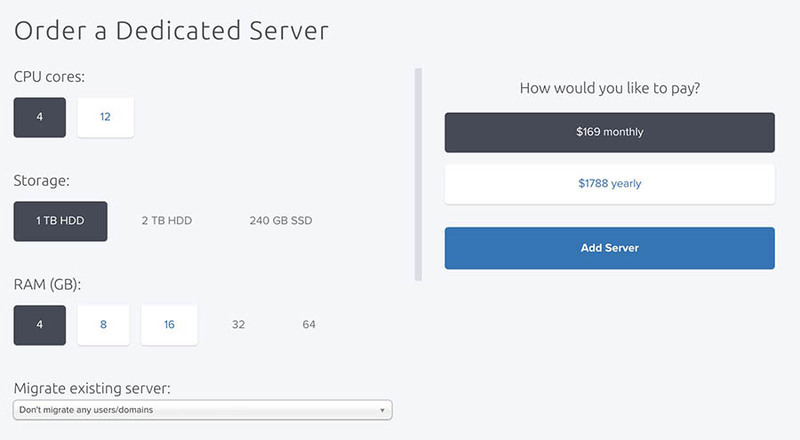 Building a server with DreamHost is easy, as long as you know what options you need. Let’s go through the settings on this page one by one, to help you build the right server for you. Your first option is to select how many Central Processing Unit (CPU) cores you want to use. The CPU is the part of your server that performs computations — think running programs. Meanwhile, a ‘core’ is an additional processing unit that doubles your CPU’s capabilities. Each core can perform one action at a time, so using multiple cores enables your server to perform more actions at once. How many CPU cores you can have depends on your server. With DreamHost, you can choose from either 4 or 12 CPU cores. The option you select depends on how much computation power your site will require at any given time. More cores means your server can process tasks and data more quickly, so consider how much power your site is likely to need and pick the option that matches. Next up, it’s time to choose how much storage your server will have. You technically have three options at your disposal here, but you might have noticed that you can’t actually select all of them. This is because the number of CPU cores you choose will change which storage options you can select. For example, the 1 TB HDD option is only available if you have chosen 4 CPU cores. Other than that, the main factors you’ll need to consider here are the amount of storage you need, and the type of hard drive you want. DreamHost offers both Hard Disk Drives (HDD) and Solid State Drives (SSD). There are plenty of differences between the two, but in general, HDDs offer more storage while SSDs tend to be considerably faster. This is because SSDs do not contain any moving parts and instead save all data on microchips, which makes them ideal for sites that need instant access, such as e-commerce stores. In contrast, an HDD works best if you need more room and speed is not as much of an issue, such as for backup servers. Random-Access Memory (RAM) is one of the most important factors that determines how well your site functions. Everything happening on your server requires RAM, and if you run out of memory, your site’s performance will suffer. Therefore, you’ll need to carefully consider how much RAM your server is going to use. To help you out, here are some of the factors that affect RAM the most. Operating System (OS). Every OS requires different amounts of RAM to run. With DreamHost, all our dedicated servers use the same Ubuntu OS, so this is less of a concern. Site traffic. The amount of traffic your site receives will dramatically affect how much RAM you need. It’s recommended to have 1 GB of RAM for every 2,500 visitors your site gets per day. Applications. All applications on your server also require RAM, including any Content Management Systems (CMS) such as WordPress. You’ll also need to consider the number of users your site has and how many sites you’re hosting. Ultimately, it’s up to you to select the option that best suits your website. However, we recommend that you select a RAM size one step above your current needs. This gives you some wiggle room. Your server will have all the resources it requires now and plenty of space to grow. If you have an existing DreamHost account and hosting plan, you can choose to migrate everything to your new dedicated server. This will carry over all your data from the old plan, including users and domains. This option is particularly helpful for sites that have outgrown their current plan. By migrating to a dedicated server, you can keep all your data and settings intact, while getting the benefits of dedicated hosting. If you do not wish to migrate any data, leave this option set to Don’t migrate any users/domains. 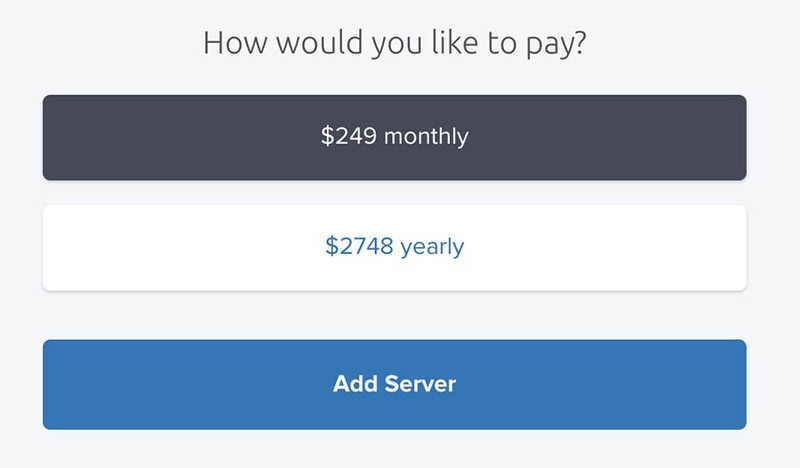 Finally, when you have configured each aspect of your server, you’ll just need to choose a payment plan. You may have noticed that the pricing options update dynamically to match the other choices you’ve made on this page. You can either opt to pay monthly or annually. If you choose a yearly payment plan, you’ll pay more upfront but will save money in the long term. Choose the option you prefer and then click on Add Server to complete your purchase. You’ve now successfully configured your dedicated server! All that remains is to confirm your payment details and your new server will be set up for you. Bear in mind that because this is a physical process, it can sometimes take a little time, especially if your chosen server is out of stock. You’ll be informed of this upfront, however, and notified when your server is ready to go. If your site gets a lot of traffic or you simply want full control over your own server, dedicated hosting can be a smart choice. It’s the option that offers the most control and best performance for your site, and it’s easier to configure than you might expect.